Amour Vert is a sustainable brand of Women’s apparel and accessories. 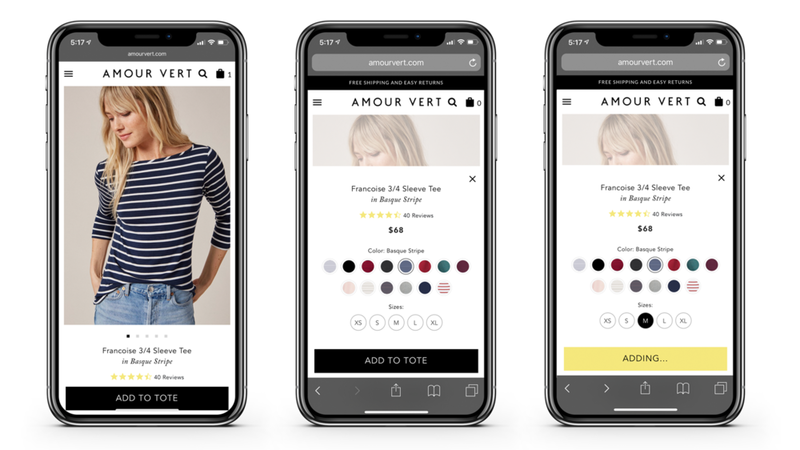 The direct-to-consumer brand has an omni-channel strategy, leveraging inventory from across seven physical stores in the United States and a distribution center, all available to purchase via their e-commerce store which is their biggest channel. I am currently Head of E-Commerce, managing a small cross-functional team. My responsibilities primarily focus on achieving growth and revenue goals, improving conversion rate via data-driven approaches to design, and collaborating with Marketing and Art Direction to conceptualize and execute campaigns and product launches. From Product Detail Page to order confirmation in less than 30 seconds. New Product Detail Page with sticky ‘add to cart’ button at bottom, and drawer UI to display color and size options. For the product detail page, I did all the research, wireframes and high-fidelity mockups for every state, on both Desktop and Mobile (responsive), including working with Development to plan and execute tests on the placement and layout of certain elements. New cart includes features such as a flag when inventory is low, as well as clear indication for pre-order items with ship date and items which are final sale. For the cart, I did all the research, wireframes and high-fidelity mockups for every state, on both Desktop and Mobile (responsive). I also planned and executed several tests, including a multi-variant test on the Desktop flow to determine if the button should link to: A) the cart page, B) directly to checkout or C) to to both, with different hierarchy options. Annotated mobile comps of cart, including different states. Annotated mobile comps of cart for Desktop. Photo of the new box sizes and mailing bag / expandable envelope. Spearheaded packaging redesign in 2018, introducing new mailer format and optimizing box sizes for shipping and packaging cost, introducing more sustainable options, better quality and significant cost savings.